I love this book, unreservedly. 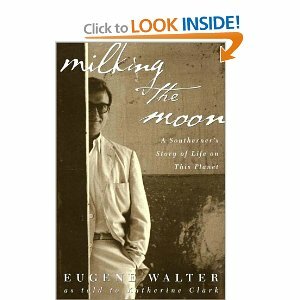 Years ago, I ran across a reference to Eugene Walter’s in The Pat Conroy Cookbook, and searched out this oral biography. I was thinking about it again recently, and took it out again. I enjoyed it just as much the second time – Walter is a born storyteller, having lived one of the most interesting lives I have ever read about. Katherine Clark met Walter a few years before his death in Alabama, and was immediately drawn into his circle. She knew what a rare soul he was, and knowing he would never finish an autobiography, recorded his stories about his life and wrote them in a book later, only lightly edited. He divided the world into people who were “cats and monkeys” and those who aren’t. Cats and monkeys were kind of his spirit animals, and it was how he described the people with whom he identified and liked. Walter lived the life of an adventurer, a born raconteur who was open to everything that life might offer. He had an interesting childhood in Alabama, and embraced his Southernness throughout all his life. He was a code breaker in WWII, moved to New York where he encountered personalities like Tallulah Bankhead, and lived the life of a poet, artist, and bookseller. He fulfilled a dream of moving to Paris, and helped George Plimpton set up The Paris Review. He later moved to Rome to edit Botteghe Oscure and to translate for Felllini films. It is hard to talk about the book without just making a list of all the famous people Walter knew – Judy Garland, T. S. Eliot, Anais Nin. That feels lame, and Walter wasn’t really bragging about all the people he met; he was just a great storyteller and entertainer who valued and welcomed experience. He never made any money, but seemed to just luck into this exotic life. Walter was a novelist, poet, editor, translator, actor, puppeteer, cook and expert party thrower. It is beyond me why he is not more famous than he is, but he seems to have been a delight and a treasure. I love this book.